Fire tornados, or ‘fire whirls,’ pose a powerful and essentially uncontrollable threat to life, property, and the surrounding environment in large urban and wildland fires. But now, a team of researchers in the A. James Clark School of Engineering at the University of Maryland (UMD) say their discovery of a type of fire tornado they call a ‘blue whirl’ could lead to beneficial new approaches in reduced carbon emissions and improved oil spill cleanup. 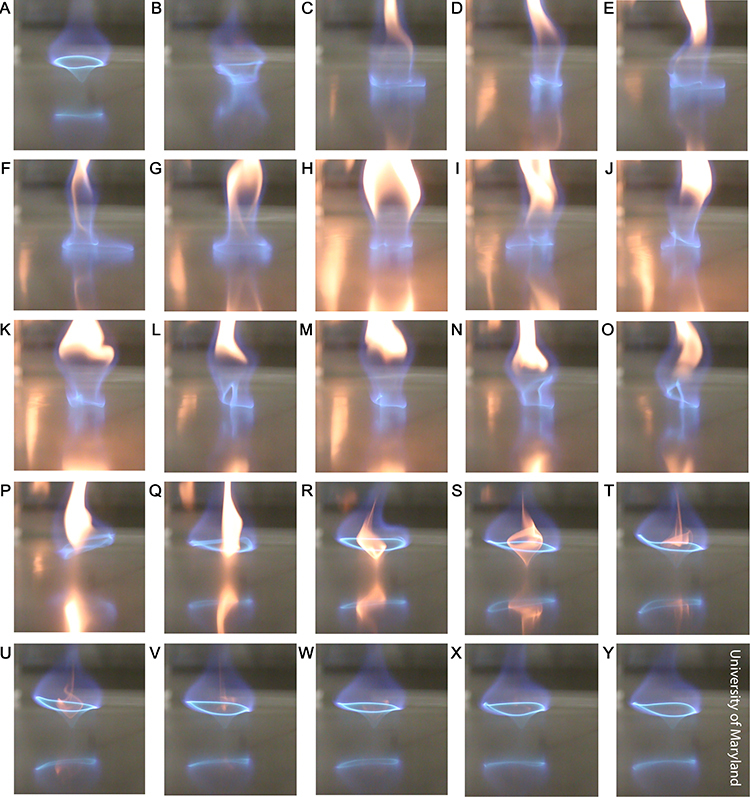 A new paper recently published in the peer-reviewed journal Proceedings of the National Academy of Sciences (PNAS) describes this previously unobserved flame phenomenon, which burns nearly soot-free. The paper's authors are Huahua Xiao, assistant research scientist in the Department of Aerospace Engineering; Michael Gollner, assistant professor in the Department of Fire Protection Engineering; and Elaine Oran, Glenn L. Martin Institute Professor of Engineering in the Department of Aerospace Engineering. Popular Science, Gorgeous 'Blue Whirl' Flame Might Help Produce Cleaner Energy, August 5, 2016. LiveScience, Watch A Blue Fire Tornado Spin, August 5, 2016. New Atlas, New "blue whirl" fire tornados spin up a cleaner burn, August 7, 2016. Gizmodo, Scientists Discovered a New Type of Fire, August 8, 2016. Nature World News, This Soot-Free Blue Fire Could Help Produce Clean Energy, August 8, 2016. Mental Floss, Researchers Discover a New Type of Fire Called 'Blue Whirl', August 8, 2016.
Business Insider, Scientists have discovered a new kind of fire, and it's beautiful, August 8, 2016. Discover Magazine Blogs, To Clean Up An Oil Spill, Light a Fire Tornado, August 8, 2016. Quartz, Scientists just discovered a new type of eco-friendly fire, August 8, 2016. The Engineer, ‘Blue whirl’ fires could help oil spill clean-up, August 9, 2016. Nerdist, Scientists Discover the Ecological "Blue Whirl" Fire Tornado, August 9, 2016. Science Alert, Scientists just discovered a new kind of fire, August 9, 2016. Christian Science Monitor, Scientists discover the 'blue whirl,' a beautiful new kind of fire, August 9, 2016.